“How do I transfer podcasts from iTunes to iPad? My friend, you are expert in this aspect. Do you know how?” Podcasts has greatly facilitated our life and made our life easier. We can take every second to absorb as much knowledge as we can via podcasts, like we can listen to podcasts when we are working or taking a bus. Also, there are bunches of good podcast contents we can always discover. As time goes by, we might save many podcasts on iTunes. However, it will be much convenient to sync podcasts from iTunes to iPad. How do I transfer podcasts from iTunes to iPad? It is really a tricky question. Take it easy, today’s article will act as a lighthouse for you to solve how to sync podcasts from iTunes to iPad. iTunes is abundant in lots of awesome media resources like music, movies, podcasts, e-books and the like. It allows us to download these wonderful items and enjoy them on the software. I often use iTunes or other ways to download Dave Ramsey’s Podcasts to my iPhone. However, some contents are not free. In other words, we have to purchase them. iTunes enables users to transfer purchased items and free items to iOS devices. If for the transferring of non-purchased items, you can only rely on other methods. How to transfer podcasts from iTunes to iPad? Now let’s see how to sync podcasts from iTunes to iPad. 1. Open iTunes and make sure you have the latest iTunes. If it is not the latest version, you can download the latest version on Apple official website. 2. Go to “Edit > Preferences > Prevent iPods ,iPhones and iPads from syncing automatically ” in the menu bar. In this way, your iPad won’t automatically sync to your iPad when you connect it to your computer. 3. Now connect iPad to computer via USB cable and iPad icon appears in the upper left corner. 4. Click on iPad icon and choose “Settings > Podcasts”. In the right interface, check “Sync Podcasts”. 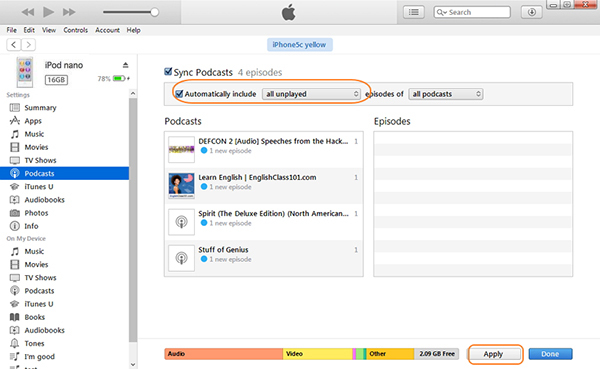 Under “Sync Podcasts”, you can choose to sync selected podcasts or all podcasts. 5. Choose “Apply” in the bottom right corner to get how to transfer podcasts from iTunes to iPad. 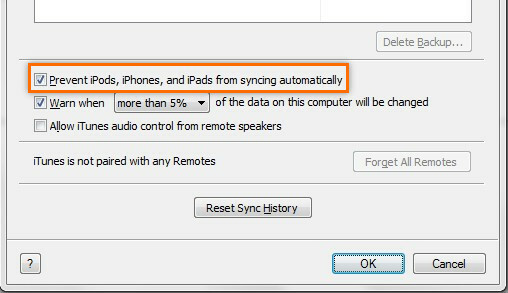 Note: when you solve how to sync podcasts from iTunes to iPad via iTunes manually, you can only sync purchased podcasts. The above introduces how to transfer podcasts from iTunes to iPad via iTunes. It is no doubt that iTunes is a terrific transferring tools between iOS devices and iTunes itself. But don’t forget that iTunes can only transfer purchased podcasts. What if you want to transfer non-purchased items? Is there any easy-to-use software that enables you to transfer non-purchased items? Leawo iTransfer will be a good choice for you. Featuring a modern and concise interface, Leawo iTransfer is capable of transferring or copying a great variety of files like apps, movies, TV shows, podcasts, videos and so on between iPad, computers and iTunes. It is safe and efficient to transfer files without efforts. You can manage files as you want like deleting unwanted songs or contacts, creating or renaming a playlist, etc. The biggest advantage of Leawo iTransfer is that it can transfer purchased and non-purchased items freely. If you want to know “how do I transfer podcasts from iTunes to iPad”, you can try Leawo iTransfer to solve it. Connect iPad to computer via USB cable and run Leawo iTransfer. In the left sidebar will be displayed the library of iPad. There are 11 kinds of categories like apps, movies, TV shows, podcasts and so on. You can also see iPad information in the right interface, listing iPad type, capacity, version, serial number and jailbroken situation. Go to “iTunes > LIBRARY > Podcasts” and check the podcasts on iTunes you want to transfer, then right click them to choose “Transfer to > iPad”. 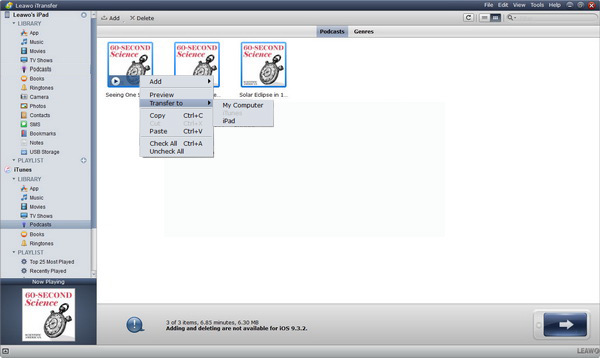 It will take a few seconds to solve how to sync iTunes podcasts with Leawo iTransfer. Soon, you complete how to sync iTunes podcasts. I believe you also have an impression on these two methods and you understand “how do I transfer podcasts from iTunes to iPad”. The biggest difference between these two methods is that iTunes doesn’t support to transfer non-purchased podcasts to iPad, while Leawo iTransfer supports to transfer purchased and non-purchased podcasts between iTunes and iOS devices. Moreover, iTransfer enables you to transfer Podcast from iPhone/iPod/iPad to iTunes. 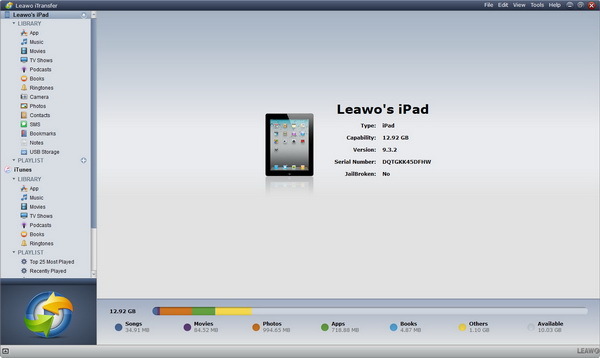 So it will be wise of you to take advantage of Leawo iTransfer to sync podcasts from iTunes to iPad. 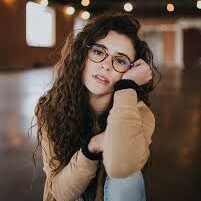 Furthermore, if you would like to transfer other types of contents like music, apps, contacts, TV shows and so forth in a super convenient and simple way, Leawo iTransfer will be your good assistant.